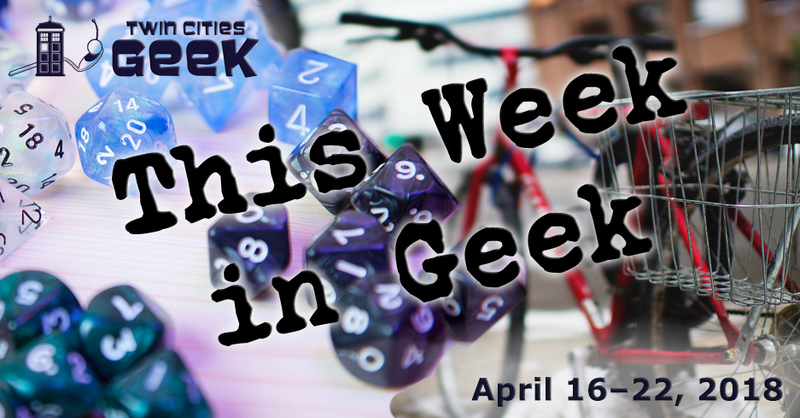 Welcome to This Week in Geek, your guide to events of interest to the Minnesota geek community for the week of Monday, April 16th to Sunday, April 22nd. When: Monday, April 16th at 6:30 p.m. When: Monday, April 16th at 7:00 p.m. Witches, Wizards, Muggles, and other Harry Potter fans unite for this night of trivia about magic, potions, sorting hats, and more at BlackStack Brewing. Gather your house together and compete for prizes, all in a great St. Paul brewery. Costumes welcome! Learn about the imaginary beasts of the northern wilds with this fun and informative event led by Reverend Matt. This is your opportunity to soak in the rich and intriguing creatures of Minnesota folklore, ranging from Ojibwe legends to classic tall tales like Babe the Blue Ox, and more. This event is cosponsored by Ramsey County Libraries and the Shoreview Historical Society. While this event is free, you should still be on the lookout for liver-eating forest monsters and other Minnesota critters! When: Tuesday, April 17th at 7:00 p.m.
Café Scientifique—presented by the Bell Museum of Natural History—is “a happy hour exchange of ideas about science, environment, and popular culture, featuring experts from a variety of fields on diverse and often provocative topics.” This month’s topic is Regeneration and will be led by Keith Sabin, PhD candidate at the University of Minnesota, and they’ll be looking at real animals with amazing regenerative capabilities, like flatworms and salamanders. Tickets are $5 to $12, online or at the door. New York Times bestselling-author Jen Sincero will be at Subtext Books for a discussion of her new book, You Are a Badass at Making Money, with a book signing to follow. You Are a Badass at Making Money focuses on the earning potential that all of us have, and getting past the stumbling blocks that would otherwise prevent financial success. This is a free event and seating is available on a first come, first served basis. Enjoy a night of community and tea with Tea and Meeples, a weekly gathering of friendly geeks at Panda Castle in Richfield. This week, cozy up with a book and enjoy some reading with friends. The dinner this week will be savory waffles. When: Tuesday, April 17th at 7:30 p.m.
Come and experience YogaQuest, a blend of yoga and fanfiction storytelling led by certified yoga instructors. Experience a yoga workout experience and a story at the same time. This week’s theme is Guardians of the Galaxy, so get ready for classic rock and trash pandas! This event costs $15. When: Tuesday, April 17th at 8:00 p.m. When: Wednesday, April 18th at 7:00 p.m.
Twin Cities film group Trash Film Debauchery, a group that “has been satisfying your unsavory cinema needs since 2003,” will return to the Trylon for a night of Gary Busey. Tickets are $5 for this screening of Quigley, a film in which Gary Busey portrays a dead billionaire inhabiting the body of a Pomeranian. When: Wednesday, April 18th at 8:00 p.m.
Pundamonium is a pun slam—a contest of wordplay with 10 contestants, each given two minutes to make puns based on prompts they are given ahead of time. The audience acts as the judge, and this process repeats throughout the night until a final pun-off. This night of groans and laughs is $6, and since this is the five-year anniversary of Pundamonium, it will be celebrated with more puns. When: Thursday, April 19th at 6:00 p.m.
Minneapolis Institute of Art continues the free Third Thursday series with a focus on sustainability for the spring. There will be interactive events like making art prints with natural objects, building May Day baskets, and a Lorax-themed photobooth, along with music, learning opportunities, and more. This event is also an opportunity to see the exhibit Power and Beauty in China’s Last Dynasty by Robert Wilson. Co-Op Talk is a monthly discussion of interactive media and digital games. The event begins with a short time to mingle and chat with snacks and refreshments, followed by this month’s discussion topic “Games Across Mediums,” led by Krista McCullough. When: Thursday, April 19th at 7:00 p.m. This regular event at Clockwerks Brewing—hosted by Sam Spadino and Sidney Oxborough—represents the convergence of two geeky favorites: a steampunk-themed bar and absurd trivia. Trivia Against Humanity has also expanded and now has weekly events at Mortimer’s and Glam Doll on Tuesdays and Modist Brewing Company on Wednesdays. See the Trivia Against Humanity Facebook page for additional events, including Arrested Development Trivia. When: Thursday, April 19th at 7:30 p.m. When: Friday, April 20th at 8:30 a.m.
Start your morning right with a talk from creative professionals hosted by the Minneapolis Institute of Art. This month, Austin Blanch, Matthew Malecha, and Jeff Tidball will be talking about the creative process behind making interactive stories. Austin Blanch and Matthew Malecha are the founders of Trailhead Games and have crafted a large number of narrative games, and Jeff Tidball is the founder of Atlas Games and creator of the excellent narrative-card game Gloom. Registration opens on Monday, April 16th at 7:00 a.m., and similar events have filled up in the past, so stay on top of that registration if you’d like to attend. When: Friday, April 20th at 6:00 p.m. When: Friday, April 20th at 7:00 p.m. When: Saturday, April 21st at 8:00 a.m., and Sunday, April 22nd at 8:00 a.m.
Live eSports are coming to Minnesota with the EPIC 1.0: eSports Tournament! Witness competitive matches of games like League of Legends and Fortnite, enjoy a gaming lounge, virtual reality, a DJ, and more. General admission is $10, and includes entry to both days of the event, money for slot machines, and discounts to the hotel and restaurants, or for $20, you can get the aforementioned benefits and unlimited entry to the tournaments themselves if you want to test your skills. When: Saturday, April 21st at 8:00 a.m. Textile and creative geeks will have an entire warehouse full of textiles to find treasures in at The World’s Largest Textile Garage Sale. There will be fabric, buttons, yarn, sewing machines, looms, and more. Entry is $3, and from 3–4 p.m., there will be a bag sale where participants can pay a flat fee of $5 for whatever they can fit into a bag. Proceeds go to benefit Textile Center‘s educational programs. When: Saturday, April 21st at 10:00 a.m. When: Sunday, April 22nd at 10:00 a.m. When: Sunday, April 22nd at 11:00 a.m. Warm up your polyhedral dice, because the United Geeks of Gaming group invites you to a Sunday of gaming! Whether you are an experienced game master wanting to run a game, or someone entirely new to the world of role-playing games who wants to join a game and learn as you go, this is the game day for you. When: Sunday, April 22nd at 12:00 p.m. When: Sunday, April 22nd at 12:30 p.m. Gender Jam—a meetup group for trans, gender-nonconforming, questioning, and intersex youth—will be meeting up for an afternoon of community and fun. This week Gender Jam will be pumping the jams for Music Day! There will be music, discussions, and art material to create whatever the music inspires. As always, bring your permission slip if you are under 18. When: Sunday, April 22nd at 7:00 p.m. Inside Voices, a poetry showcase series allowing audiences to experience poetry in intimate settings, will be bringing experimental poetry to the Honey. See performances from Keno Evol, Mollie Lacy, Sagirah Shahid, Terrence Shambley (Samoa the Poet), and Kenny Ngo, and the host for this event is Sarah Ogutu. Tickets are $6 in advance or $8 the day of the show. Lots to do this week, thanks Jon!